Comment: Slope in side of house. Comment: I have a crawl space that is moist and I would like suggestions and bids on how to best repair. Comment: Water enters our living room through the attached garage every time there's a heavy rain. The water enters at the ground level, underneath the floorboards. I suspect that water may be entering under gaps in the garage door, and from there going underneath the wall into our living room. I'm interested in finding out whether or not placing a drain in front of the garage would alleviate the issue. The house and garage share a concrete slab foundation which I believe was poured in the early 1950s. I am happy to provide any other necessary details. Comment: Home Inspector determined there was standing water under the vapor barrier and loose insulation the sub area. Comment: I would like to get an estimate for installing a french drain put in. Comment: water collecting in low point under house. 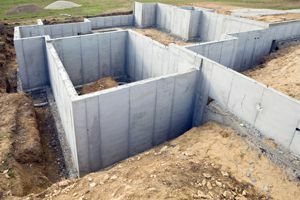 concrete perimeter foundation with dirt floor. Part standing and part crawl space. J Todd & Company Inc.
Medford Foundation Contractors are rated 4.70 out of 5 based on 172 reviews of 11 pros. Not Looking for Foundations Contractors in Medford, OR?